Visit Giggle online at Giggle.com for all your needs from infancy to beyond, this online baby boutique has simply everything a mother needs for her child. Shop Giggle for a wide variety of compact, easy-to-store and easy-to-carry baby items including baby toys, baby clothing, baby bedding, furniture and so much more. Giggle's baby products, toys and other items are made up of complete allergy-free, non-toxic and sustainable materials, ensuring maximum health and hygiene to little ones. Each product undergoes a rigorous screening process by experts before it gets released. Check 58Coupons for the latest Giggle deals, Giggle coupons and Giggle savings. Act now to save an additional 20% on Quinny strollers and accessories from Giggle.com. Click link. Purchase from the Petunia Pickle Bottom gift sets collection from Giggle.com and you can receive 15% off with this coupon code. Use this coupon code when you purchase a Set of Baby Swaddle Blankets and a 2-pack of Better Basics Gowns to receive 10% off! 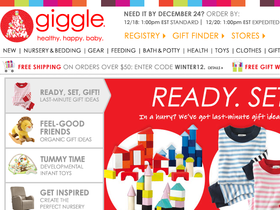 Act now and receive a free baby tee with registry using this coupon from giggle.com. Click link to begin. When you sign-up to become a member of Giggle.com they will send you a $75 gift card. Click for details. Shop the Sale at Giggle where you can save up to 75%. Click link to save today. Visit Giggle.com today and save up to 50% on top brands. Click link and start shopping.